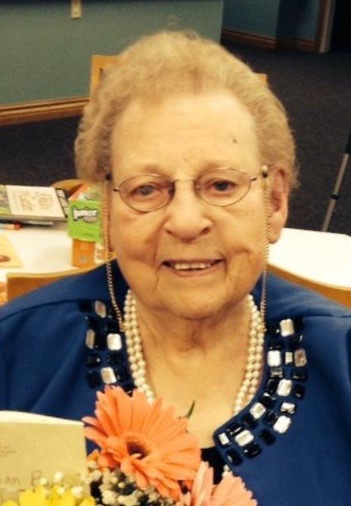 Memorial Mass for Marian Jo (Kalkowski) Barta, 90, Norfolk, will be 11:00 a.m., Saturday, March 30, 2019 at St. Mary’s Catholic Church in Norfolk. Visitation will be an hour prior with a rosary at 10:30 a.m. at the church. Interment will be at Prospect Hill at a later date. Her body has been donated to Creighton University. Home for Funerals is in charge of arrangements. The daughter of Albin A. and Rose (Sedivy) Kalkowski was born on November 28, 1928 at Lynch, Nebraska. She grew up in Boyd County. She attended elementary school at District 62 and graduated in 1946 from Lynch High School. After graduation, she taught in rural schools in Boyd and Knox counties for several years. She also attended Wayne State College. She married Harold “Dale” Barta of Verdel, Nebraska on June 19, 1951 at Blessed Virgin Mary Catholic Church in Lynch. They went into farming south west of Verdel. In 1967, they moved to Norfolk. She was a homemaker and worked for 12 years in the Federal Nutrition program in northeast Nebraska. She was a lifetime member of the Catholic church, Altar Society and a member of the Catholic Daughters of the Americas for over 50 years. She was also a member of the American Legion Auxiliary, lifetime member of the V. F. W. and the Purple Heart Auxiliary. She was a member of the Bound for Glory Choir for many years and a part of the birthday club for over 30 years. She especially enjoyed her family, crocheting, oil painting, and reading. Marian and Dale also enjoyed a number of tours in the U. S. and Canada. Marian is survived by her five children and their spouses including three daughters, Sheila and Bill Miller of Omaha, Roseanne Earnest and special friend Jeff Abler of Council Bluffs, Beata and Doug Burkink of Norfolk; two sons Perry Barta of Battle Creek, MI, Paul Barta and fiancé Amy Postma of Phoenix, AZ, five grandchildren Amanda Boltz, Toby and Cory Miller, and Chelsea and Myles Burkink, six great- grandchildren, sister in- law Kay Lynn Kalkowski, and numerous nieces and nephews. She was preceded in death by her husband Dale, parents, brother Laurence Kalkowski, sisters Frances Schochenmaier and Irene Burbach, and two brothers- in- law. The family would like to give a special thank you to Heritage of Bel Air and Ascera Hospice Care for the great care given to their mother and grandmother.